Indiana’s Cool North has no shortage of interesting, entertaining, and eclectic things to see and do. And what’s a great way to see some of the best? Road trip bingo! 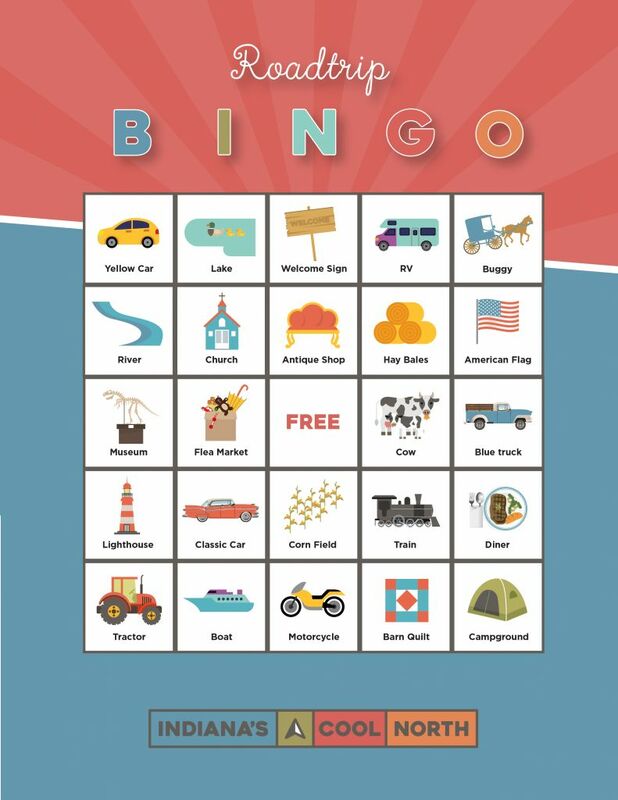 Download and print our custom bingo game for a fun way to make the most of your travels around Northern Indiana. You won’t have to drive for ages to see almost everything featured on these cool cards—you can pack a lot of adventure in to just one day around here. Need some tips on where to find a few items? Read below for suggestions on where to find these unique attractions in Northern Indiana. From local history, to planes, trains, and automobiles, each of our seven counties have interesting and educational museums that offer a great way to spend an afternoon. 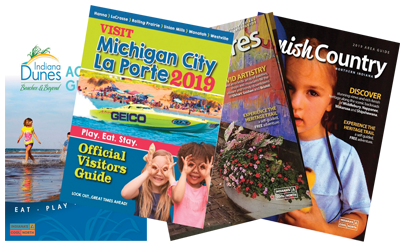 Hang out with some real characters at a superhero museum in Elkhart County, learn about the early days of firefighting in Indiana Dunes, marvel at classic cars in South Bend, or get your head in the clouds at an aircraft museum in Kosciusko County. To check off both the museum and train spaces on your bingo card, visit the Hesston Steam Museum in Michigan City LaPorte. Explore even more of the coolest museums in Northern Indiana. If you’ll be staying at one during your getaway to Indiana’s Cool North, you’re already ahead of the game! If not, you’ll pass by plenty of places. From beachfront, to lakeside, to a quiet country escape, you’ll find campgrounds around almost every turn. Need a little more inspiration? Check out some of the best camping spots around. Lighthouses might not be the first thing to come to mind when you think of the Midwest, but you can certainly find a few along the shore of Lake Michigan, as well as some of our inland lakes. One of the most photographed spots in the region, the Michigan City Lighthouse and Pier is a popular spot to spend some time on the beach. Bingo! The Old Lighthouse Museum is another two-for-one for your card. Head to Culver to see a more miniature lighthouse on the shore of Lake Maxinkuckee, or explore the eclectic shopping and dining district at The Village at Winona Lake. Learn more about how to experience lake life in Indiana’s Cool North. Both Marshall and LaGrange Counties have beautiful barn quilt trails that make for a memorable drive through Northern Indiana. Each of these big, bright, quilt-patterned murals celebrates the history of agriculture, the time-honored tradition of quilting, and true Hoosier community pride. Each mural is unique, so it’s definitely worth trying to take in as many as you can as you drive through Indiana’s Cool North. We’re big on eclectic antique shops and fun flea markets around here, so you won’t have to travel too far before you can check one or both of these entries off your bingo cards. Get your fill in Goshen with over 25,000 square feet of antiques at the Goshen Antique Mall, check out the charming downtown of New Carlisle, stop by “The Antique Town” of Pierceton, or sit back and watch the auction action at Shipshewana Trading Place—also home to the Midwest’s largest flea market. Find even more shopping fun when you create your own “Antiques Roadshow” in Indiana’s Cool North. It’s no secret that Northern Indiana is home to a rich, thriving Amish culture. In some parts of the region a buggy might even pull up next to you at a stoplight! Take the Heritage Trail Driving Tour in Elkhart County for a sure sighting, visit Amish Acres in Nappanee for an in-depth experience, or take the back roads and discover authentic Amish goods at quaint shingle shops. These are just a few of the incredible things to see and do in Indiana’s Cool North. For even more road trip recommendations, click here.